Features: medium sized playground structure with several slides, a wobbly bridge (that doesn’t really wobble though), race car wall (that actually turns! ), some climbing things. Separate baby swings and big kid swings (2 respectively). Two bouncy motorcycles and one digger (very cool!). Surrounding Park Area: Gorgeous area with lots of greenspace. On one end of the park (near the city of Atlanta sign) is a structure with turtles (see the pictures) that you can climb and stand on. Super fun for the climbers out there! A very nice paved side walk goes through the park with ample amounts of lush green grass leading up to the playground. 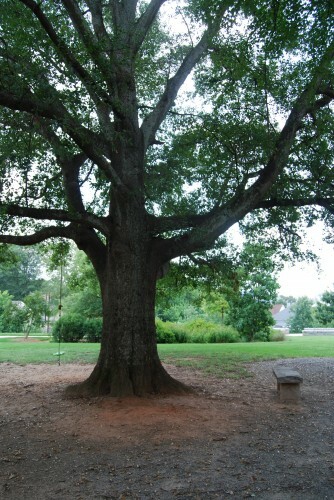 Past the playground is an area with several very large oak trees surrounded by benches. On the main oak tree is a tree swing. Very cool! Shade: The playground itself is super sunny and definitely hot in the summer time! The area with the trees is wonderfully shady. Seating: Several benches in the playground area and several benches throughout the park. Stroller/Wheelchair Access: Yes, leading up to the playground along the sidewalk. Safety: No particular features pose a safety risk on the playground. Today (July 2011), my son complained that the slides were too hot, but that is summer in Atlanta for you. The slides are plastic like most other playground slides. Cons: The playground structure is not brand brand new and actually reminds me a lot of the Grant Park Playground (same colors, mostly same features, but smaller). There is nothing particularly wrong with that, as the playground is very nice and lacks nothing. The water fountain directly adjacent to the playground does not work, although the one by the oak trees does. There is also no bathroom on site. Finally, the actual playground is super sunny. Overall Assessment: Lovely playground and park. This park once was the location of an elementary school that was shut down in 1976 and acquired by the neighborhood (if you have the time, definitely read the history of Cabbagetown, very interesting!!). Through a process of basically 10 years (yes, 10 years!! ), the land was secured and a playground was built and completed in 2005. You can tell that the neighborhood loves this park as it is especially clean and well-maintained. There is some sort of romantic, old southern feeling sitting on the swing beneath the stately oak tree. Makes me feel like I’m a character in an old southern novel as I swing from this tree. I love it!